For other uses, see Brick (disambiguation). The oldest discovered bricks, originally made from shaped mud and dating to 7500 B.C., were found in in the upper Tigris region and in southeast Anatolia close to Diyarbakir. Other more recent findings, dated between 7,000 and 6,395 B.C., come from Jericho and Catal Hüyük. The first sun-dried bricks were made in Mesopotamia (what is now Iraq), in the ancient city of Ur in about 4000 BC, although the arch used for drying the bricks was not actually found..
Other examples of civilizations who used mud brick include the ancient Egyptians and the Indus Valley Civilization, where it was used exclusively. In particular, it is evident from the ruins of Buhen, Mohenjo-daro and Harappa. The Romans made use of fired bricks, and the Roman legions, which operated mobile kilns, introduced bricks to many parts of the empire. Roman bricks are often stamped with the mark of the legion that supervised their production. The use of bricks in southern and western Germany, for example, can be traced back to traditions already described by the Roman architect Vitruvius. ...the kilnmaster had to make sure that the temperature inside the kiln stayed at a level that caused the clay to shimmer with the colour of molten gold or silver. He also had to know when to quench the kiln with water so as to produce the surface glaze. To anonymous laborers fell the less skilled stages of brick production: mixing clay and water, driving oxen over the mixture to trample it into a thick paste, scooping the paste into standardized wooden frames (to produce a brick roughly 42 cm long, 20 cm wide, and 10 cm thick), smoothing the surfaces with a wire-strung bow, removing them from the frames, printing the fronts and backs with stamps that indicated where the bricks came from and who made them, loading the kilns with fuel (likelier wood than coal), stacking the bricks in the kiln, removing them to cool while the kilns were still hot, and bundling them into pallets for transportation. It was hot, filthy work. The idea of signing the worker's name and birth date on the brick and the place where it was made was not new to the Ming era and had little or nothing to do with vanity. As far back as the Qin Dynasty (221 BC–206 BC), the government required blacksmiths and weapon-makers to engrave their names onto weapons in order to trace the weapons back to them, lest their weapons should prove to be of a lower quality than the standard required by the government. In the 12th century, bricks from Northern-Western Italy were re-introduced to Northern Germany, where an independent tradition evolved. It culminated in the so-called brick Gothic, a reduced style of Gothic architecture that flourished in Northern Europe, especially in the regions around the Baltic Sea which are without natural rock resources. Brick Gothic buildings, which are built almost exclusively of bricks, are to be found in Denmark, Germany, Poland, and Russia. During the Renaissance and the Baroque, visible brick walls were unpopular and the brickwork was often covered with plaster. It was only during the mid-18th century that visible brick walls regained some degree of popularity, as illustrated by the Dutch Quarter of Potsdam, for example. The transport in bulk of building materials such as bricks over long distances was rare before the age of canals, railways, roads and heavy goods vehicles. Before this time bricks were generally made close to their point of intended use. It has been estimated[by whom?] that in England in the eighteenth century carrying bricks by horse and cart for ten miles (16 km) over the poor roads then existing could more than double their price. Bricks were often used, even in areas where stone was available, for reasons of speed and economy. The buildings of the Industrial Revolution in Britain were largely constructed of brick and timber due to the demand created. During the building boom of the nineteenth century in the eastern seaboard cities of Boston and New York City, for example, locally made bricks were often used in construction in preference to the brownstones of New Jersey and Connecticut for these reasons. The trend of building upwards for offices that emerged towards the beginning of the 19th century displaced brick in favor of cast and wrought iron and later steel and concrete. Some early 'skyscrapers' were made in masonry, and demonstrated the limitations of the material – for example, the Monadnock Building in Chicago (opened in 1896) is masonry and just seventeen stories high; the ground walls are almost 6 feet (1.8 m) thick, clearly building any higher would lead to excessive loss of internal floor space on the lower floors. Brick was revived for high structures in the 1950s following work by the Swiss Federal Institute of Technology[disambiguation needed] and the Building Research Establishment in Watford, UK. This method produced eighteen-story structures with bearing walls no thicker than a single brick (150–225 mm). This potential has not been fully developed because of the ease and speed in building with other materials; in the late-20th century brick was confined to low- or medium-rise structures or as a thin decorative cladding over concrete-and-steel buildings or for internal non-load-bearing walls. Bricks may be made from clay, shale, soft slate, calcium silicate, concrete, or shaped from quarried stone. Clay is the most common material, with modern clay bricks formed in one of three processes - soft mud, dry press, or extruded. The soft mud method is the most common, as it is the most economical. It starts with the raw clay, preferably in a mix with 25-30% sand to reduce shrinkage. The clay is first ground and mixed with water to the desired consistency. The clay is then pressed into steel moulds with a hydraulic press. The shaped clay is then fired ("burned") at 900-1000 °C to achieve strength. Xhosa brickmaker at kiln near Ngcobo in the former Transkei in 2007. In modern brickworks, this is usually done in a continuously fired tunnel kiln, in which the bricks move slowly through the kiln on conveyors, rails, or kiln cars to achieve consistency for all bricks. The bricks often have added lime, ash, and organic matter to speed the burning. In India, brick making is typically a manual process. The most common type of brick kiln in use there are Bull's Trench Kiln (BTK), based on a design developed by British engineer W. Bull in the late nineteenth century. An oval or circular trench, 6–9 meters wide, 2-2.5 meters deep, and 100–150 meters in circumference, is dug. A tall exhaust chimney is constructed in the centre. Half or more of the trench is filled with "green" (unfired) bricks which are stacked in an open lattice pattern to allow airflow. The lattice is capped with a roofing layer of finished brick. In operation, new green bricks, along with roofing bricks, are stacked at one end of the brick pile; cooled finished bricks are removed from the other end for transport. In the middle the brick workers create a firing zone by dropping fuel (coal, [wood], oil, debris, etc.) through access holes in the roof above the trench. West face of Roskilde Cathedral in Roskilde, Denmark. The advantage of the BTK design is a much greater energy efficiency compared with clamp or scove kilns. Sheet metal or boards are used to route the airflow through the brick lattice so that fresh air flows first through the recently burned bricks, heating the air, then through the active burning zone. The air continues through the green brick zone (pre-heating and drying them), and finally out the chimney where the rising gases create suction which pulls air through the system. The reuse of heated air yields savings in fuel cost. As with the rail process above, the BTK process is continuous. A half dozen laborers working around the clock can fire approximately 15,000-25,000 bricks a day. Unlike the rail process, in the BTK process the bricks do not move. Instead, the locations at which the bricks are loaded, fired, and unloaded gradually rotate through the trench. The dry press method is similar to mud brick but starts with a much thicker clay mix, so it forms more accurate, sharper-edged bricks. The greater force in pressing and the longer burn make this method more expensive. With extruded bricks the clay is mixed with 10-15% water (stiff extrusion) or 20-25% water (soft extrusion). This is forced through a die to create a long cable of material of the proper width and depth. This is then cut into bricks of the desired length by a wall of wires. Most structural bricks are made by this method, as hard dense bricks result, and holes or other perforations can be produced by the die. The introduction of holes reduces the needed volume of clay through the whole process, with the consequent reduction in cost. The bricks are lighter and easier to handle, and have thermal properties different from solid bricks. The cut bricks are hardened by drying for between 20 and 40 hours at 50-150 °C before being fired. The heat for drying is often waste heat from the kiln. European style extruded bricks / blocks are use in single wall construction with an applied finish inside and outside. They have many voids, the voids being a greater fraction than the solid, with thin walls of fired clay and come in 15-25-30-42-50 cm widths. Some models have very high thermal performance suitable for Passivhaus type buildings. The raw materials for calcium silicate bricks include lime mixed with quartz, crushed flint or crushed siliceous rock together with mineral colourants. The materials are mixed and left until the lime is completely hydrated, the mixture is then pressed into moulds and cured in an autoclave for two or three hours to speed the chemical hardening. The finished bricks are very accurate and uniform, although the sharp arrises need careful handling to avoid damage to brick (and brick-layer). The bricks can be made in a variety of colours, white is common but pastel shades can be achieved. It is very common in Sweden, especially in houses built or renovated in the '70s. Here it is referred to as "Mexitegel" (en: Mexi[can] Bricks). In India these are known as Fly ash bricks, manufactured using the Falg process. The fired colour of clay bricks is influenced by the chemical and mineral content of raw materials, the firing temperature and the atmosphere in the kiln. For example pink coloured bricks are the result of a high iron content, white or yellow bricks have a higher lime content. Most bricks burn to various red hues, if the temperature is increased the colour moves through dark red, purple and then to brown or grey at around 1,300 °C (2,372 °F). Calcium silicate bricks have a wider range of shades and colours, depending on the colourants used. The names of bricks may reflect their origin and colour, such as London stock brick and Cambridgeshire White. Bricks formed from concrete are usually termed blocks, and are typically pale grey in colour. They are made from a dry, small aggregate concrete which is formed in steel moulds by vibration and compaction in either an "egglayer" or static machine. The finished blocks are cured rather than fired using low-pressure steam. Concrete blocks are manufactured in a much wider range of shapes and sizes than clay bricks and are also available with a wider range of face treatments - a number of which are to simulate the appearance of clay bricks. An impervious and ornamental surface may be laid on brick either by salt glazing, in which salt is added during the burning process, or by the use of a "slip," which is a glaze material into which the bricks are dipped. Subsequent reheating in the kiln fuses the slip into a glazed surface integral with the brick base. Natural stone bricks are of limited modern utility, due to their enormous comparative mass, the consequent foundation needs, and the time-consuming and skilled labour needed in their construction and laying. They are very durable and considered more handsome than clay bricks by some. Only a few stones are suitable for bricks. Common materials are granite, limestone and sandstone. Other stones may be used (e.g. marble, slate, quartzite, etc.) but these tend to be limited to a particular locality. For efficient handling and laying bricks must be small enough and light enough to be picked up by the bricklayer using one hand (leaving the other hand free for the trowel). Bricks are usually laid flat and as a result the effective limit on the width of a brick is set by the distance which can conveniently be spanned between the thumb and fingers of one hand, normally about four inches (about 100 mm). In most cases, the length of a brick is about twice its width, about eight inches (about 200 mm) or slightly more. This allows bricks to be laid bonded in a structure to increase its stability and strength (for an example of this, see the illustration of bricks laid in English bond, at the head of this article). The wall is built using alternating courses of stretchers, bricks laid longways and headers, bricks laid crossways. The headers tie the wall together over its width. A bigger brick makes for a thicker (and thus more insulating) wall. Historically, this meant that bigger bricks were necessary in colder climates (see for instance the slightly larger size of the Russian brick in table below), while a smaller brick was adequate, and more economical, in warmer regions. A notable illustration of this correlation is the Green Gate in Gdansk; built in 1571 of imported Dutch brick, too small for the colder climate of Gdansk, it was notorious for being a chilly and drafty residence. Nowadays this is no longer an issue, as modern walls typically incorporate specialized insulation materials. The correct brick for a job can be picked from a choice of colour, surface texture, density, weight, absorption and pore structure, thermal characteristics, thermal and moisture movement, and fire resistance. In England, the length and the width of the common brick has remained fairly constant over the centuries, but the depth has varied from about two inches (about 51 mm) or smaller in earlier times to about two and a half inches (about 64 mm) more recently. In the United States, modern bricks are usually about 8 × 4 × 2.25 inches (203 × 102 × 57 mm). In the United Kingdom, the usual ("work") size of a modern brick is 215 × 102.5 × 65 mm (about 8.5 × 4 × 2.5 inches), which, with a nominal 10 mm mortar joint, forms a "coordinating" or fitted size of 225 × 112.5 × 75 mm, for a ratio of 6:3:2. Blocks have a much greater range of sizes. Standard coordinating sizes in length and height (in mm) include 400×200, 450×150, 450×200, 450×225, 450×300, 600×150, 600×200, and 600×225; depths (work size, mm) include 60, 75, 90, 100, 115, 140, 150, 190, 200, 225, and 250. They are usable across this range as they are lighter than clay bricks. The density of solid clay bricks is around 2,000 kg/m³: this is reduced by frogging, hollow bricks, etc. ; but aerated autoclaved concrete, even as a solid brick, can have densities in the range of 450–850 kg/m³. The term "frog" for the indentation on one bed of the brick is a word that often excites curiosity as to its origin. The most likely explanation is that brickmakers also call the block that is placed in the mould to form the indentation a frog. Modern brickmakers usually use plastic frogs but in the past they were made of wood. When these are wet and have clay on them they resemble the amphibious kind of frog and this is where they got their name. Over time this term also came to refer to the indentation left by them. Bricks are used for building and pavement. 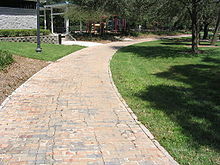 In the USA, brick pavement was found incapable of withstanding heavy traffic, but it is coming back into use as a method of traffic calming or as a decorative surface in pedestrian precincts. For example, in the early 1900s, most of the streets in the city of Grand Rapids, Michigan were paved with brick. Today, there are only about 20 blocks of brick paved streets remaining (totalling less than 0.5 percent of all the streets in the city limits). In the United Kingdom, bricks have been used in construction for centuries. Until recently, almost all houses were built almost entirely from bricks. Although many houses in the UK are now built using a mixture of concrete blocks and other materials, many houses are skinned with a layer of bricks on the outside for aesthetic appeal.